Microsoft is trying to be transparent just like Salesforce in their Trust Center site in letting their customers know when something is impacting their services in their various data centers. This could be anything from outages, backed bugs and misconfiguration or just general failures. 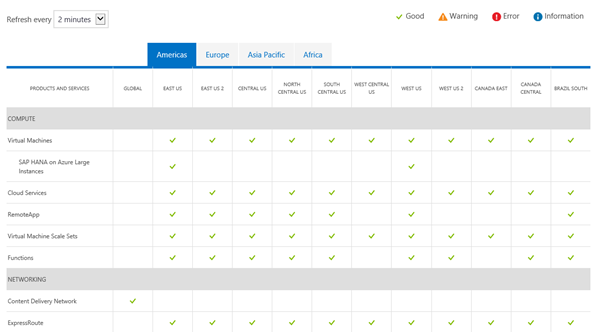 This transparency is indicated in the Azure Status page where Microsoft lists the status (Good, Warning, Error or Information) of each Azure service/product by each region. From this page, you can also drill down to see all of the historic events that have occurred along with, the summary of impact, root cause and mitigation, next steps and ability to provide feedback. Sometimes the problem on the Azure service is a result of an update to the functionality and this can be seen in the Azure Updates page. Visit the Azure Status page now to check the status of your Azure service!